Keeping in the spirit of slow food here in Torino, here is a recipe made entirely of local, seasonal products. Buon apetito! Cut each floret into slices no more than 1/2 inch thick. Melt organic butter olive oil in a large sauté pan over medium-heat until it bubbles white. 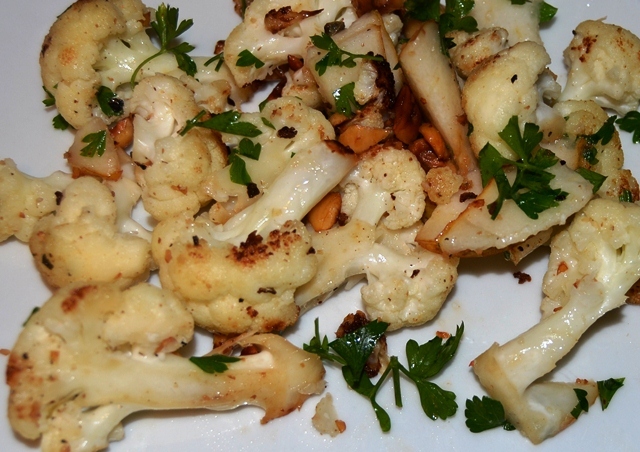 Add the hazelnuts, sage and sliced cauliflower and cook together, stirring or shaking the pan every 30 seconds or so to keep them from sticking, until the cauliflower begins to soften for about 2 minutes. Add the salt and pepper and cook for another 4 to 5 minutes, until the cauliflower browns a bit. Turn off the heat and add the pear slices and parsley. Remove from the stove and mix all the ingredients together. Serve immediately. Why do hazelnuts have such a great health reputation then? Like all nuts, these contain healthy fats, and are particularly high in monounsaturated fats, which are proven to reduce bad cholesterol (LDL) and increases good cholesterol (HDL). It is also a great source of vitamin E, antioxidants and fiber; a good source of magnesium and a source of iron. Some research also shows that it helps disolve kidney stones.